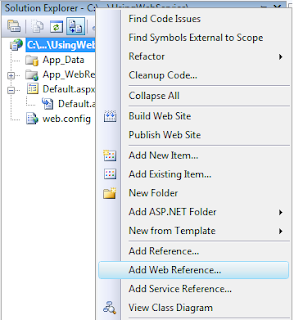 Here I will explain what webservice is, uses of webservice and how to create webservice and how to consume webservice in asp.net. 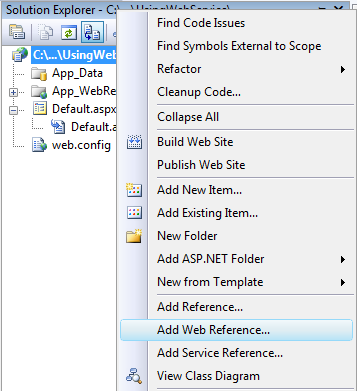 Today I am writing article to explain about webservices. 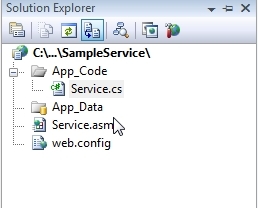 First we will see what is webservice is and uses of webservice and then we will see how to use webservice in our applications. 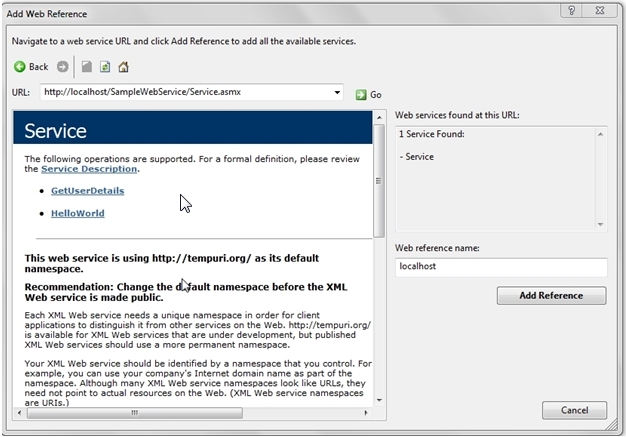 Web Service messages are formatted as XML, a standard way for communication between two incompatible system. And this message is sent via HTTP, so that they can reach to any machine on the internet without being blocked by firewall. Weather Reporting: You can use Weather Reporting web service to display weather information in your personal website. Stock Quote: You can display latest update of Share market with Stock Quote on your web site. News Headline: You can display latest news update by using News Headline Web Service in your website. In summary you can any use any web service which is available to use. You can make your own web service and let others use it. Example you can make Free SMS Sending Service with footer with your advertisement, so whosoever use this service indirectly advertise your company... You can apply your ideas in N no. of ways to take advantage of it. SOAP (simple object access protocol) is a remote function calls that invokes method and execute them on Remote machine and translate the object communication into XML format. In short, SOAP are way by which method calls are translate into XML format and sent via HTTP. WSDL stands for Web Service Description Language, a standard by which a web service can tell clients what messages it accepts and which results it will return. WSDL contains every detail regarding using web service and Method and Properties provided by web service and URLs from which those methods can be accessed and Data Types used. 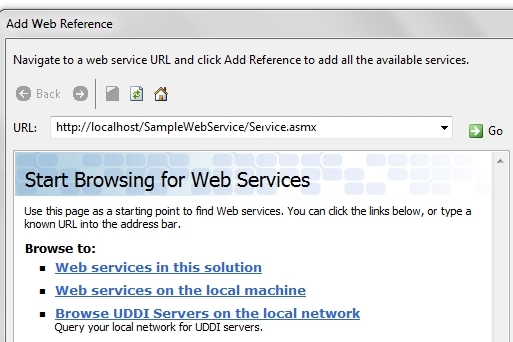 UDDI allows you to find web services by connecting to a directory. What is Discovery or .Disco Files? 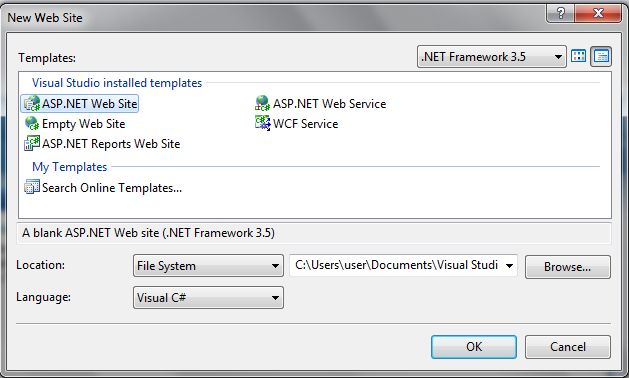 Discovery files are used to group common services together on a web server. Discovery files .Disco and .VsDisco are XML based files that contains link in the form of URLs to resources that provides discovery information for a web service. Disco File contains URL for the WSDL, URL for the documentation and URL to which SOAP messages should be sent. // Create an instance of DataSet. // Return the DataSet as an XmlElement. Here we need to remember one point that is adding [WebMethod] before method definition because we need to access web method pulically otherwise it’s not possible to access method publically. If you observe above code I converted dataset to XmlElement t because sometimes we will get error like return type dataset invalid type it must be either an IListSource, IEnumerable, or IDataSource to avoid this error I converted dataset to XmlElement. 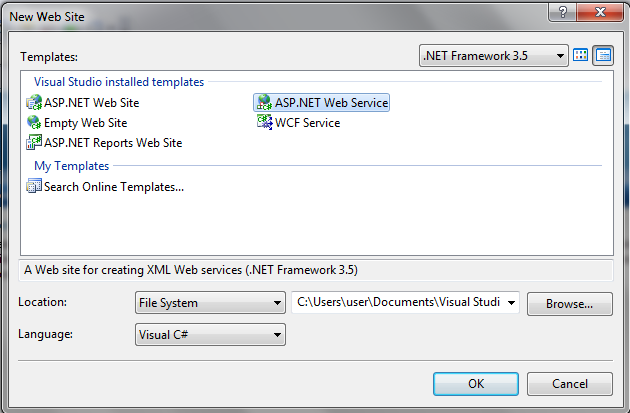 How to Use Web service in web application?